Antisemitic poster [cutout?] 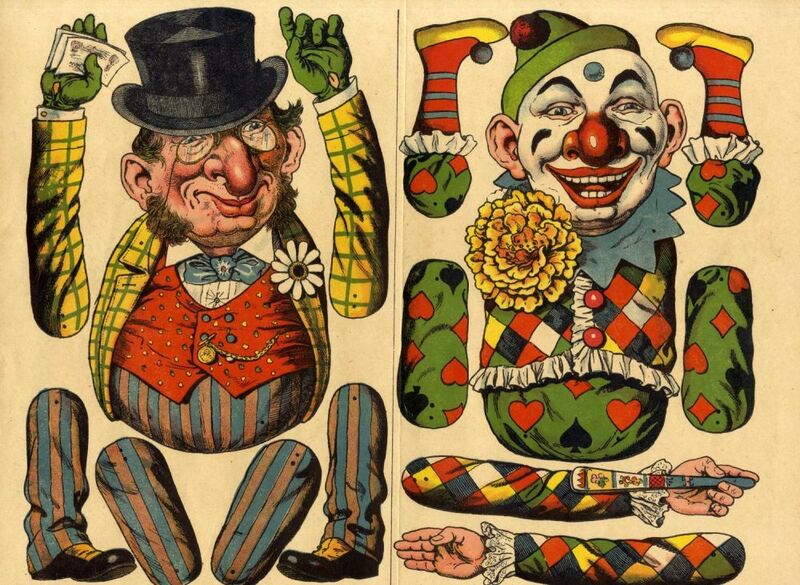 depicting gentile and Jewish clowns facing each other. Germany, c. 1930s. Unknown. Leaf apparently meant for cutting and assembling the figure of a clown. There is a gentile clown on the right with a smiling face and colorful lively clown costume in contrast to the Jewish clown on the left: the image of a banker waving money in one hand and shaking the other in a threatening manner. He has a long nose, a serious face and a fake closed-mouth smile. Where there is a large, impressive flower on the gentile's outfit, there is a small, simple flower on the Jew's. "Ziehfigur" appears on the lower left.